A server-intense environment presents a unique set of challenges – all of which are neatly addressed by TecCrete access flooring from Haworth. 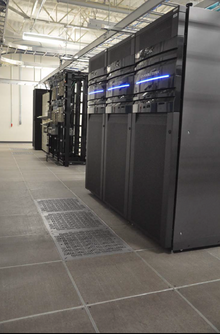 Rock solid and quiet underfoot, TecCrete provides the necessary strength to support the tremendous loads required in the data center. At the same time, the bare TecCrete data center is designed to maintain plenum integrity to help combat rising energy costs. TecCrete lays the foundation for an agile, efficient data center that is ready to evolve as the organization grows and new technologies emerge. Forget what you think you know about access flooring. Because unlike steel access floors, TecCrete employs a number of innovations – from the panels to the structures below – that add up to exceptional strength and durability. As a result, TecCrete offers the industry’s longest standard warranty on a raised floor system. TecCrete’s concrete and steel composite panels are the most rigid in the industry, offering 50 percent less flex than other options. Naturally, this is preferred in many applications because TecCrete eliminates the feeling of being on an access floor – but in a data center, it’s critical to the performance of the space. 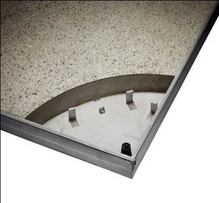 Galvanized steel TecCrete pedestals provide a strong base for the flooring system, in heights from three to 68 inches. Pedestals offer an adjustment range of up to two inches, creating a level surface even when the subfloor is irregular or deep power and data channels are present. 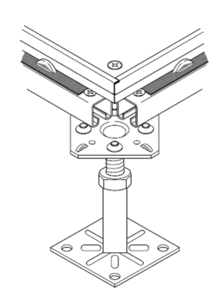 Optional ramping systems provide smooth transitions between floor heights. In addition, to ensure the optimum level of safety and security, stringer – supported and cornerlock understructures are available. When compared to the equivalent cement – filled steel panel, TecCrete offers 20 percent better 10-pass rolling load performance. Incorporation the integrated air seal enables you to stop almost three times the air leakage through the panel seams when compared to the out-dated steel welded designs.